Given my love of bread, my freezer is packed full of different bread and bread-like items. English muffins, naan, bagels, and pita round out the supply of bread I keep stashed. It’s a handy supply for when I don’t know what to cook. I love making pita. It’s a little effort but there’s a certain joy in watching the pita puff up while baking (it’s the little things.) 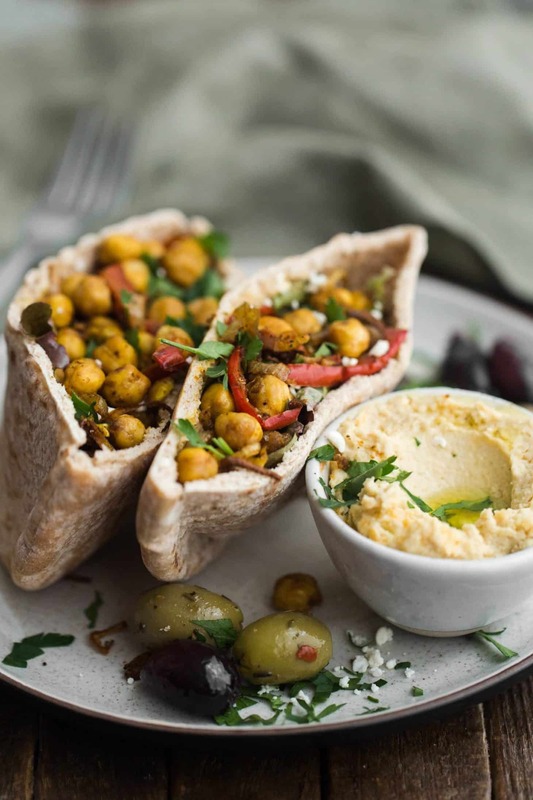 This chickpea shawarma pita is my ideal lunch. Full of good protein and is such a warm meal thanks to the spices. As mentioned in the last shawarma recipe I posted, the spice list is long but they are all handy to have in your cupboard for future meals. 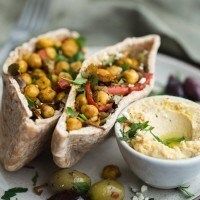 A flavorful vegan sandwich with chickpeas cooked in shawarma spice then stuffed in a pita with hummus and lettuce. Preheat oven to 400˚ F. In a medium bowl, combine minced garlic with spices (cumin through the cayenne pepper). Add in the olive oil and stir until well combined/paste has formed. Stir in the chickpeas, red onions, and red pepper, using a spatula to toss and coat. Transfer chickpeas to a roasting pan and cover with foil. Bake for 30 minutes until chickpeas are hot and onions are tender. Slice each pita in half and heat the pita until just warm enough they are pliable. Open the pocket and spread 1 tablespoon of hummus in each. Follow with a handful of lettuce and 1/4 of the chickpea mixture. Repeat with remaining pita halves. Serve with extra hummus, parsley, and feta if desired. Tips & Tricks: Make the chickpeas ahead of time. They are great for dinner as a grain bowl- use half for dinner then save the other half for this lunch. 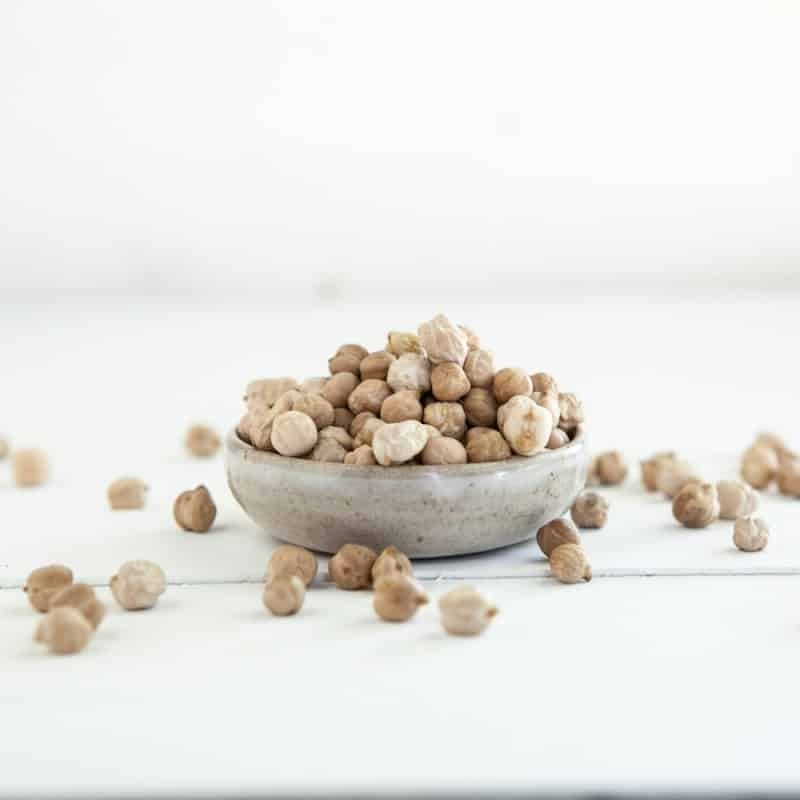 Gluten-Free: What I love most about the chickpea base is that it’s vegan and gluten-free. For this recipe, try your hand at some gluten-free pita! Dressing: While I smear a massive amount of hummus on my pita, a drizzle of a lemon vinaigrette adds a nice pop of flavor and moisture to the chickpeas. Salad: Skip the pita (or toast the pita into pita chips) and take a salad instead! Chickpeas are my favorite lunch staple. They can stand in for many items in many forms. One of my favorite items is the chickpea salad sandwich. Not only quite, it’s filling and can be made in big batches. Thank you for sharing the recipe, I love making pita, so now I have another great reason to get my hands in some dough! A vegetarian food blog that’s healthy, delicious and looks so yummy? Hells to the yeah. I am definitely going to be making this one night, as I and my partner are on a low-carb diet and we’ve been looking for good recipes that even my housemate would like (he’s very fussy, and it drives me bonkers that a 30-something year old doesn’t like eggplant, cucumber, zucchini, mushrooms, beans on their own, corn, and a whole bunch of other food). All of the food that he likes are carb-loaded which makes it very hard on us since I have to cook for all three of us. This actually made my stomach rumble. I’m trying to eat a little more healthier, and daaaaaaamn, this looks so good, I was drooling as I scrolled through! This pita sounds so satisfying!! And healthy. Definitely need to try! This looks so amazing. Yum! I always heat mine up- makes it more pliable/less likely to crack! Made this for my family, it was really great! Awesome- so glad to hear! Love this, Erin. I love making falafel, but the deconstructed spin here, using chickpeas themselves, is a big time saver, and the end result is lovely! I can’t deal with this, my 2 favorite things (chickpeas and shwarma) in a single dish! Cannot wait to try this! Thank you so much for reposting this recipe. I made it last winter and had forgotten about it, but after seeing the recipe again I made it last night. It was one of the best meals we’ve had recently and it was so easy to make! Thank you for your wonderful recipes! The chickpeas are amazing! Taste more Indian than Middle Eastern in my opinion, LOVE THE! 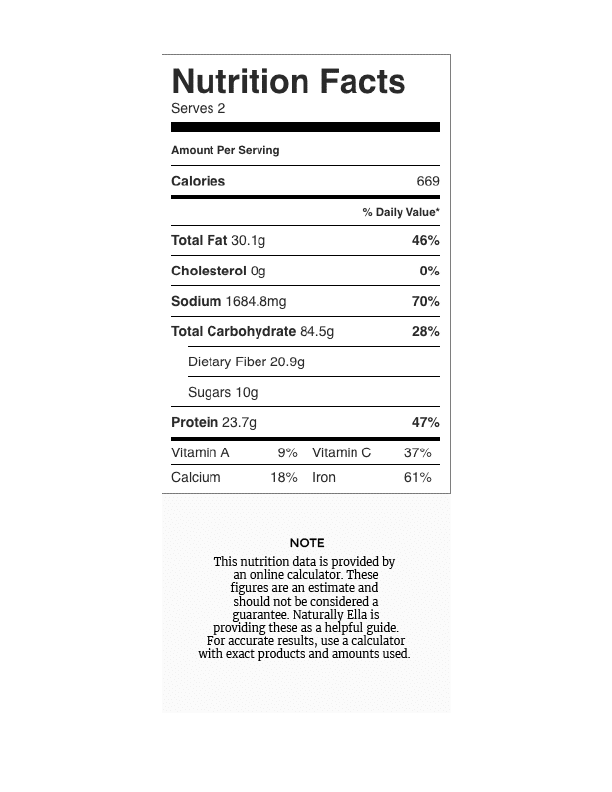 Super easy recipe That’s delish! I didn’t do the pita part, but out would be amazing I’m sure. You nailed it Naturally Ella ? I was expecting this to be good, but wow… this was delicious!!! I changed the ratios a bit and used 2 red bell peppers and an entire red onion with 1 can of chickpeas, and really liked it. Thank you!! Perfect! I always play around with ratios, for me it’s the spice thought counts! This was so good, and so easy too. I roasted it a little longer to firm the chickpeas up a bit more, and it was great. Thanks so much! If I am using dried chickpeas. Is the cooking time still correct, do I need to soak them first? This sounds great. 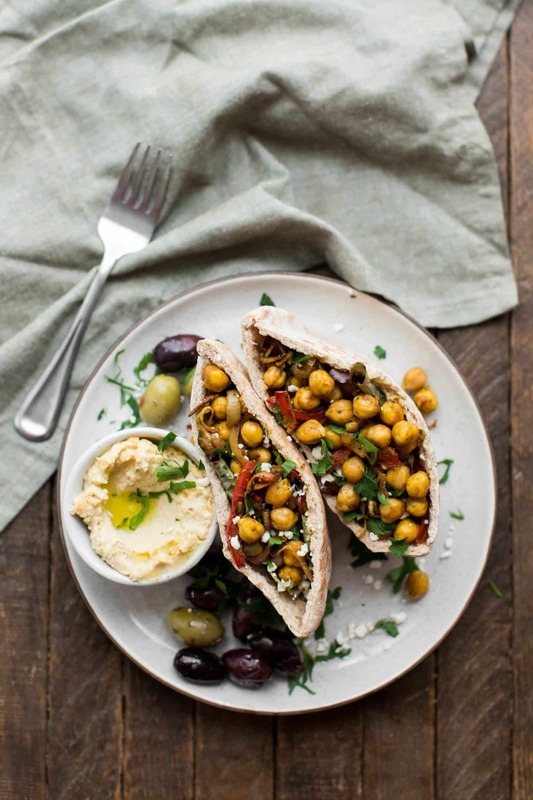 I love chickpeas, and love cooking Mediterranean, can’t wait to try it! You will need to use cooked chickpeas, so you will want to soak and then cook them until tender. I simply cannot stop drooling over this. I make pita of flat breads 4 times a week and I eat chickpeas all day everyday. This is exactly what I need in my lunch life right now. I have everything I need for this and am totally going to make this tomorrow! Thanks so much for sharing. Your recipes are divine! Love it!!! I use 1Tbsp coconut oil, and the rest H2O when making the spice paste, comes out GREAT!????? Thank you so much for this wondeful, tasty, Arabic-Indian hybrid chickpea recipe…major YUM! I just made this today! This recipe is definitely a keeper. It’s simple to make and is so full of flavor. It really is a beautiful recipe. Thank you for sharing! This sounds absolutely delicious. As an Israeli living in the US, i definitely miss my Shawarma and am so happy to have a vegan alternative that I can make at home! I make this all the time. It’s become my go-to. Every time I order groceries I always have to get chickepeas so I can make this recipe. I put it on salads or just eat it by itself. Made this last night for dinner – really good. We used lemon hummus from Whole Foods and it brightened everything up. The spices were great! This recipe has become such a staple in our house. It’s a fantastic weeknight dinner or terrific made-ahead for lunches. I find when I’m short on one of the spices, it always turns out just fine – the overall combination of spice and warmth works with different notes and proportions. Thank you so much for sharing this marvelous dish!